A few months ago I showed you a tooth fairy pillow but I didn't give you the instructions. I decided to put that right today and add to the fun with a video tutorial. This card is a blast from the past, but no less beautiful for being that. I'll start off by admiting that this fancy fold card is not the easiest card on the planet to make. but it is one of the most satisfying. 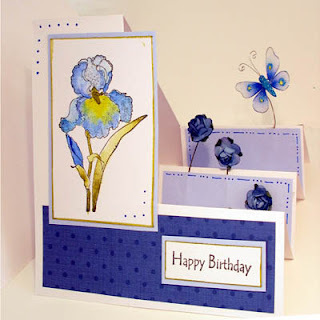 I've chosen is beautiful iris stamp to showcase on this card. The flowers can be bought here. The stamp which is from, Stampinback, here. Would you like to boost your blog? Well, here's your opportunity. Link to www.craftfairy.co.uk and Craft Fairy will link to you. All you have to do is send her a message with the link and she will post a link. That way, you should see the traffic on your blog increase. Today is the first in a series of post that will highlight the rubber stamp sale. 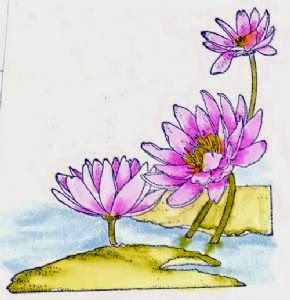 Stamp size: 2-3/4" x 3"
So here's a beautiful waterlily rubber stamp. Use it to make delightful Spring time cards and scrapbook pages. This is fabulous as a decoupage card too. The flowers just lend themselves to layering. I've seen lots of Tooth Fairy pillows are being posted on Pinterest. I thought that they looked cute but they needed a Craft Fairy makeover. So I decided to make a bright and cheerful one that can be used for other things once the teeth have all fallen out. This über cute tooth fairy pillow is only 10cm wide. Just the right size for slipping under the child's pillow on the bed. The pocket is formed by laying a piece of pink felt over the white base. Remember to sew the sides closed but to leave the top open. 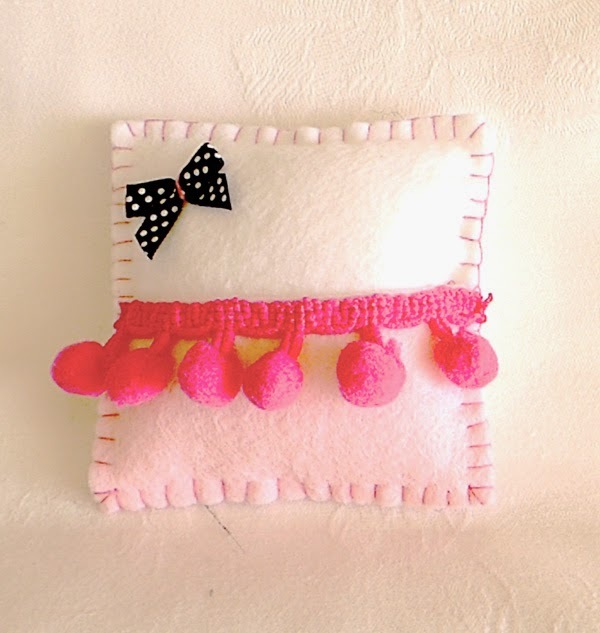 Sew the pompom trim to the pink felt before sewing the sides of the pillow. I also used a pink thread for the blanket stitch and sewing on the bow. The pillow is stuffed with white pillow filling. Felt is currently unavailable on Craft Fairy so please contact me for a supply. 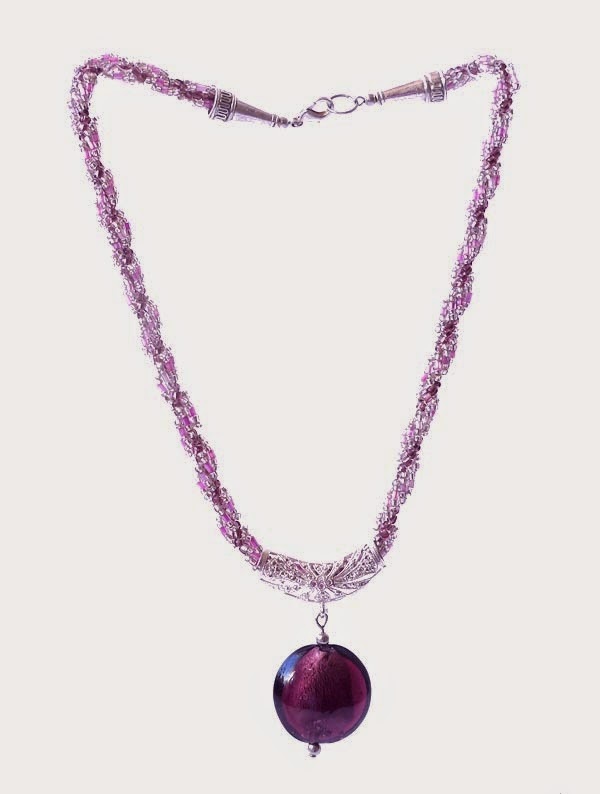 Amethyst Necklace with a twist. A spiral rope necklace in fact. I have some beautiful large silverlined glass beads. They are lentil shaped which means that they are discs with a dome shape in the middle. I also have the Silver Colour Scarf Tube Pendant x 2, which I used to hang the pendant. Now, I'm not pretending that this was quick to make as it was not. The rope will take a couple of evenings but, when that's done, the rest is a breeze and the effect is stunning. If you are interested I can make up a kit for you at the cost of £10. This will include everything except the fireline and needle. I think that this blog is becoming a bit heart obsessed. Or could that be me? Which ever thing it is I have made another heart for you all. Can't decide if I went over the top with the flower, but I rather like it. 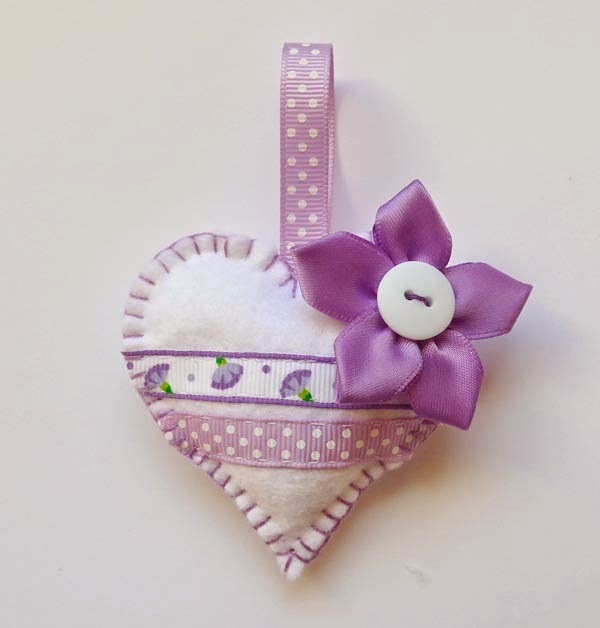 I also used lilac embroidery thread and a white button. The crimson heart die cuts are really beautiful. I played around with the ribbons, buttons and bows and came up with this combination. Hope that you like it too. Some stuffing and thread to sew it together. 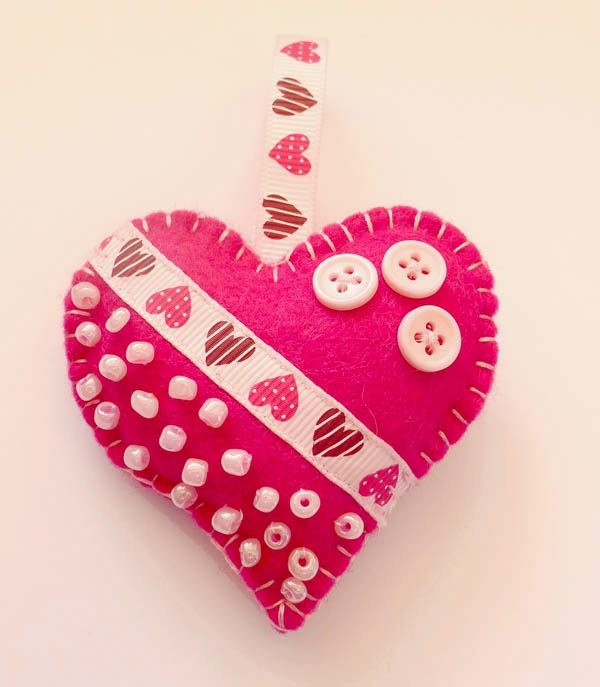 You will get far more products than you need to make this heart, so you'll have plenty left over to make something else. Lately I've been working with ribbons to make a set of stunning ribbon roses. Suddemly I realised that I didn't have the really wide chiffon ribbon in stock and I just had to get it in and quickly. So, today my parlcle arrived and I've abandoned my sewing in favour of putting the ribbons on the web site. I know that you'll love them too. I'll start off with the 40mm chiffons in 25 Metre Reels. I've done this so that you can get cheaper prices. 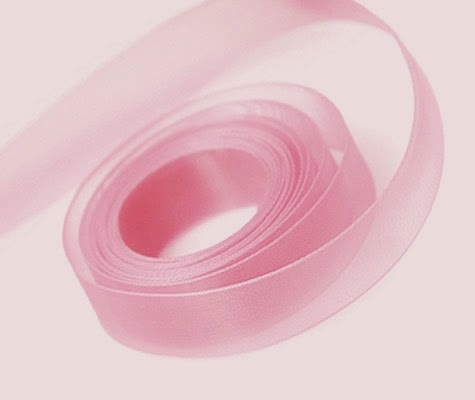 Now you'll have to come back tomorrow to see what I've done with these ribbons. I,m working my way through a rainbow of felt colours as I want to make a felt heart bunting to hang on my stand at the NEC in March this year. 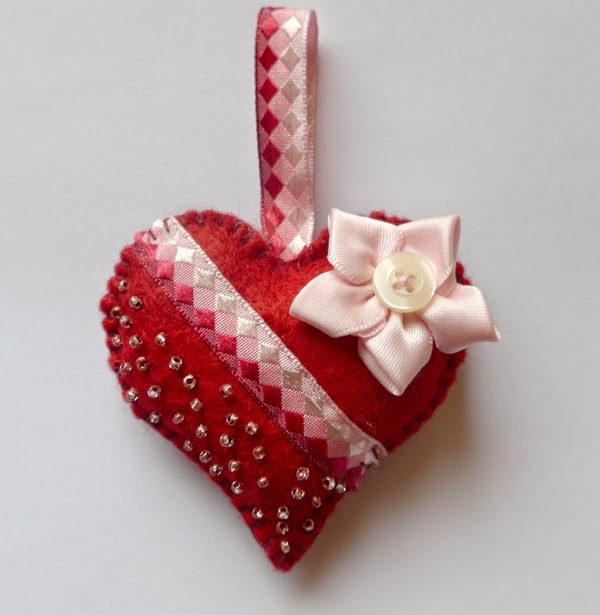 I realised that I hadn't made any hearts from the cerise felt so I put that right this morning and came up with this design. It's a kit too so, if you want one, you can get it from Craft Fairy. Just click on 'kits'. My banner is coming on a pace. It measures 2 metres when the hearts are touching. All I need to do is make sure that it will be about 7 metres long. If I leave a space between each heart I think that I may be about there. I'll get a long piece of 16mm grosgrain out and give it a try. The hearts are really light so they won't put much pull on the bunting and the velcro. That's my idea and I'm going with it. Fingers crossed.